Left: Lygia Clark, "Structuring the Self." Center: Annette Messager, "My Little Effigies (Mes Petites Effigies)." Right: Lynn Hershman Leeson, "Self-Portrait as Another Person." bitforms gallery is pleased to announce an exhibition that explores the sense of touch as a metaphor of bodily presence and an extension across boundary. Actualizing our understandings of public/private and inside/outside, touch is a gesture system. It manipulates physical, social, psychological and electronic domains, aiding in their transformation. Presenting a cross-generational selection of voices, "Touched: A Space of Relations" includes the work of four prominent artists working in Europe and the Americas. With the earliest work dating from 1966, the exhibition brings into focus a visual conversation between the artists Janine Antoni, Lygia Clark, Lynn Hershman Leeson and Annette Messager. Highlights from the exhibition include four earlier works showing publicly in NYC for the first time: "Self Portrait as Another Person" (1966-68) by Lynn Hershman Leeson; a 13-part installation of the series "Mes Petites Effigies" (1989-90) by Annette Messager; and two pieces from the series "Mes Trophées" (1986-88) also by Messager. Linking all the works together is touch's ability to function inside the realms of fantasy, dream or simulacrum. Interior worlds of therapeutic sensation are discovered Lygia Clark's "Structuring the Self" (1976/88), in which relational objects serve as surrogates for physical contact. Also rooted in gesture and care of the body, Janine Antoni's bronze urinal prosthesis, "Conduit" (2009) is paired with the beauty-obsessed "Ingrown" (1998). In "Up Against" (2009) Antoni merges architecture of the home with the body. As an over arching theme in many of the pieces by Lynn Hershman Leeson is a very human impulse to feel the world around us and then respond to it – as seen in two new interactive installations. 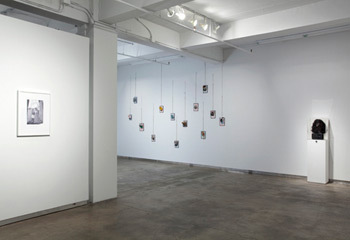 For example, "Home Front – Cycles of Contention" picks apart the psychology of a domestic dispute, and in the "!WAR Graphic Novel and Curriculum Guide" an intervention is made within the academic history of the American Feminist Art Movement. While the bedside table and lamp has been a staple of our lives since there was such a thing as a bed and a table, there is now a new invention being floated around by French firm Quarks that may make it obsolete. 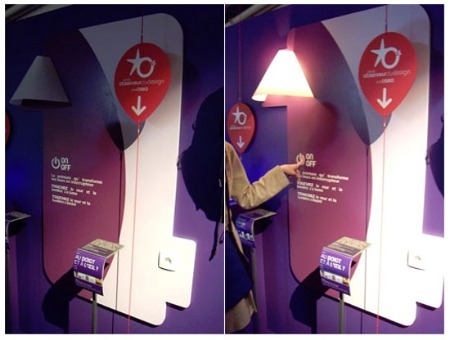 With Quarks’ new paint, the entire wall acts as an on and off switch meaning that you no longer need to put a lamp close enough for you to reach over and turn off. The On/Off Paint will record a single touch and carry an electric current that will turn a device on or off. The best part of the paint is that it does not take a great deal of wiring in order to make it work, simply determine the area you want to paint and as long as it is around a plug you’ll be able to touch any part of that area. While this isn’t currently available in the United States, if the company knows what’s good for it, the On/Off Switch Paint will be here soon. "(...). You can understand what's happening today much better if you see history the way I do. For 500 years the Church controlled society by reigning over images. With the advent of the mass media, it gradually lost its power, and media magnates circulated whatever images they want, and Hollywood has extended its empire around the world. Now images are undergoing another upheaval, marking the decline of newspaper and television. People have moved onto this [gesturing at his iPad]. The monopoly on the distribution of images has been shattered. Now I can circulate whatever I want for free. This new era also signals the changing nature of photography." "In my book Secret Knowledge, I demonstrated that photography existed long before chemical development on paper. Art historians may dispute it but I don't mind: this is the result of observation by a painter, an insider's view. Why did Caravaggio invent Hollywood lighting? Because he used a whole system of lenses, concave mirror and a camera obscura to project faces and real objects onto the canvas. Vermeer, Van Eyck, Canaletto, Chardin and Ingres used these methods. The invention of the camera in 1837 was just a way to fix the projection on paper. That lasted 160 years and now it's over. Now it's the era of digital photography, manipulating images, and the come back of manual dexterity. The idea that photography is the most striking illustration of reality is outdated. In this country, possessing or looking at certain kind of photos will land you in jail. I ask you: how can anyone tell whether or not these photos have anything to do with reality? Has this point been discussed? No. Has it been talked about in the art world? No. People think the world is like photography, but the camera gives us an optical projection of the world. It sees the world in a spectacular way, whereas we perceive it psychologically. No matter how good a photo may be, it doesn't haunt you the way a painting can. A good painting embraces ambiguities that can never be untangled; that's why it's so fascinating. (...) Painting will always be superior to photography in one respect: time, that juxtaposition of moments which is what makes a great painting so deep, rich and ambiguous. It has been said that the surface is all that matters. But that is to cancel what can be called the magic of art. The magic is the indeterminate part. I think the only way to renew art is to go back to nature. Nature is unlimited; it's foolish to say that we've seen it all." Can we still speak about "nature" (I mean, a place where there's no wifi, no telecom networks and no communication --probably in the deep oceans, in foreign and/or inaccessible landscapes or high in the moutains --but even the Himalayas got wifi recently, Swiss mountains are all covered by Swisscom networks...--; do we have to speak about "manual dexterity" or "sotware dexterity"? Nonetheless, this is a quite interesting quote from Mr. Hockney! We’ve seen virtual keyboards before, but the technology has never quite taken off. But this is quite exceptional. 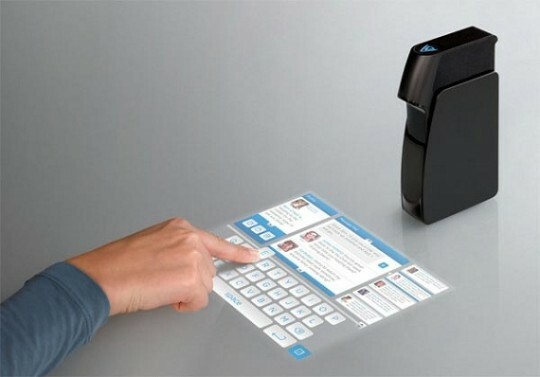 UK-based Light Blue Optics (LBO) has unveiled a revolutionary compact projector that lets users interact with images projected onto a flat surface, essentially turning it into a touch screen. Remarkably, it has built-in Wi-Fi and Bluetooth connectivity, which allows users to access and connect with internet-based applications and engage in social networking and multimedia sharing via the projector itself, which runs Adobe Flash Lite 3.1. 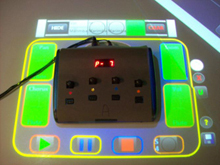 The Light Touch projector transforms the usually static image created by a projector into interactive multimedia content using Light Blue Optics’ proprietary holographic laser projection technology. The device can project a virtual 10-inch interactive display onto any surface and the integrated infra-red touch sensing system enables users to interact with the virtual image in the same way they would use a handheld touchscreen device. The device is set to be showcased in an invite-only event on Thursday, January 7th at CES. LBO also announced a list of global companies working with the Company to bring its unique projection technology to market; Adobe, CSR, Foxconn, Interbrand, Microsoft, Micron, Nichia, Photop, Opnext and Toshiba. It comes equipped with 2GB of onboard Flash memory and has a Micro SD card slot for up to 32GB of storage, running wall-powered or battery-operated, with a run-time of two hours before recharging is required. The Light Touch certainly looks very interesting, but there are no details on pricing or availability yet. Most sci-fi fans remember the movie Minority Report, and the scene where Tom Cruise manipulates data on a large, vertical, virtual screen using only his hands and fingers. Although I prefer to do my computer work sitting down, it was the stuff geek dreams are made of, and now Apple has applied for a patent that sounds eerily similar. AppleInsider has the details, but the gist of it is this: Apple’s multitouch functions currently implemented on the iPhone and on Macbook trackpads are nice enough, but aren’t good enough for a larger screen (a larger screen on a mythical Apple tablet device, that is). 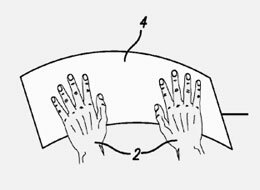 Therefore, Apple’s new patent describes a far more sophisticated multitouch input method, allowing for use of all ten fingers, complex movements and, yes, proper typing. Built-in sensors should be able to distinguish various hand configurations, detect when the user wants the cursor to move, and enable various types of input (typing, manipulating 2D objects, and handwriting). We can’t say all of this is definite proof that an Apple tablet is coming, but it’s painfully easy to imagine all of this applied on such a device. Minority Report syndrom again... This time possibly coming to a table(t) near you. A Microsoft project lets a touch screen control other hardware. Halo effect: This MIDI controller is surrounded by virtual controls. Four of the virtual buttons control discrete tasks, including playing or pausing a track. The physical knobs provide finer control of the same function than the four virtual sliders. Watch the touch screen and audio-editing hardware developed by Microsoft. Large touch-screen tables have emerged as a useful way for several people to collaborate on projects like video editing or graphic design, but often these tasks require fine controls that can be difficult to simulate on a touch surface with limited resolution. When a person needs precision, it may be best to use a physical controller instead, says Dan Morris, a researcher at Microsoft. Morris and his colleagues have developed software for touch-screen surfaces that allows physical controls to be added to them. In addition, the software lets people define the functions that each knob, button, and slider on a controller will perform. The researchers' system, called Ensemble, was presented on Monday at the Computer-Human Interaction (CHI 2009) Conference in Boston. It consists of a custom-made touch table that is two meters long and one meter wide, and several portable sound-editing controllers that connect to the computer that controls the surface. The table is similar to Microsoft's Surface, but larger. As with Surface, cameras underneath the tabletop are used to sense when a user touches the surface or when an object is placed on top of it. The idea of incorporating traditional input devices like mouses or keyboards with a touch display is not new, but the Microsoft researchers show with Ensemble that it's possible to make hardware do more than a single specified task. Cameras within the Ensemble table detect a special tag on the bottom of each audio control box to recognize each box and determine its position on the surface. The software then produces an "aura" around each device, including touch-surface controls like "play," "pause," and "stop," and virtual sliders that correspond to physical knobs on the box. A person can then edit a music track, for example, using both the physical device and the touch-surface controls. The virtual sliders can be used to zoom in on the audio waveform of a track, or to go to a different location on the waveform by panning. The physical knobs on the box perform the same function but offer much finer control. The system also allows a person to change the function of the knobs to, say, control the volume of a trumpet track instead. "It's a software mechanism for telling the hardware what to do," says Morris. He explains that once a person has mapped different functions onto the controller, she's able to save it for later or pass it along to someone else who has a similar role in the editing process. 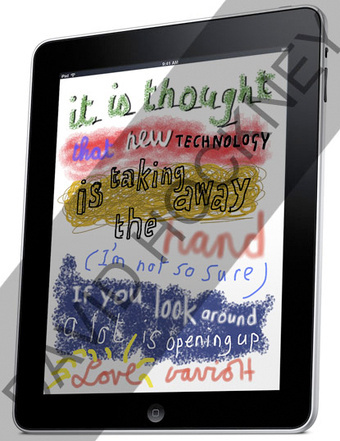 The paper, presented at CHI 2009 by Rebecca Fiebrink, a graduate student at Princeton University, also describes a study examining how people used the interface. Most of the study participants used the physical controls, favoring the accuracy and responsiveness that they offer. However, these participants also made extensive use of surface controls, choosing them mainly for tasks in which a single touch produced a discrete result, such as playing or stopping a track. Robert Jacob, a professor of electrical engineering at Tufts University, in Medford, MA, says that the researchers "did a nice job of investigating what users actually did when given both [physical controllers and a touch screen] and the opportunity to switch between them." Jacob, who chaired the session in which the paper was presented, acknowledges that bridging the gap between physical and digital objects can be challenging. "It's a difficult problem with no general solutions, but rather individual interesting designs," he says. "Ideally, you want the benefits of the digital without giving up those of the physical." While Ensemble was designed for sound editing, its underlying technology could find other applications in graphics, gaming, and visual design, says Morris. "It could be used in scenarios where you want people to collaborate on a surface as a group," he says, but where the resolution of touch surface limits the precision of the virtual controls. Pas encore très concluant (voir la vidéo: interaction très lente... et je demande à voir une fois une véritable collaboration "de travail" dans un tel contexte), mais il y a de l'idée dans cette sorte de réalité augmentée partagée à plusieurs et projetée autour d'outils de travail ou d'édition.